Wheat Market to Rally; Corn Next? 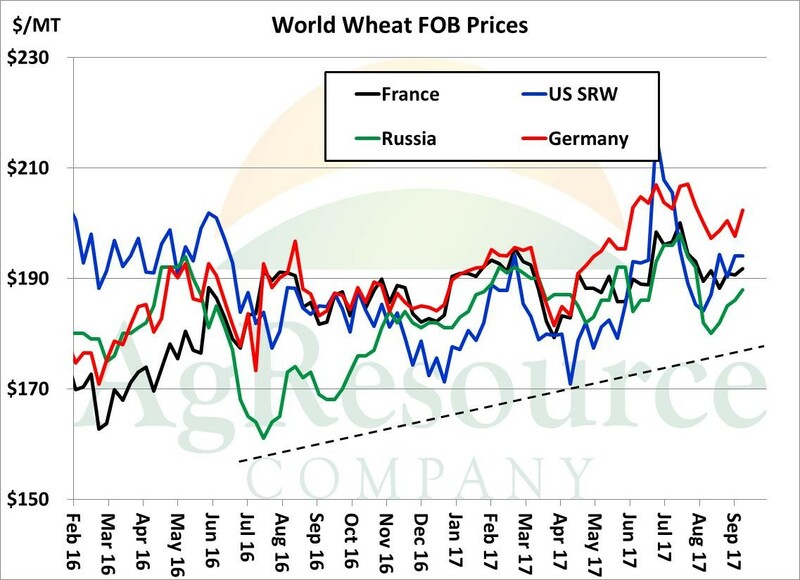 The world wheat market no doubt found a seasonal bottom in late August – much like last year – and as global demand is found, cash wheat prices are expected to rise, albeit slowly, into late fall. World wheat prices are only somewhat important in eastern Nebraska, but this is likely to pull corn values higher as well and, most importantly, the world has much smaller supply of feed wheat this year. As such, major importers in East Asia are likely to return to the global corn market in the months ahead, and total corn trade is projected to be a record 151 million tons in 2017/18. Russian wheat prices in the Sep-Nov quarter are a major driver of grain markets elsewhere – including corn – and there’s a rather strong seasonal tendency for that market to rise. This phenomenon has been a bit delayed, but overall the trend remains intact. 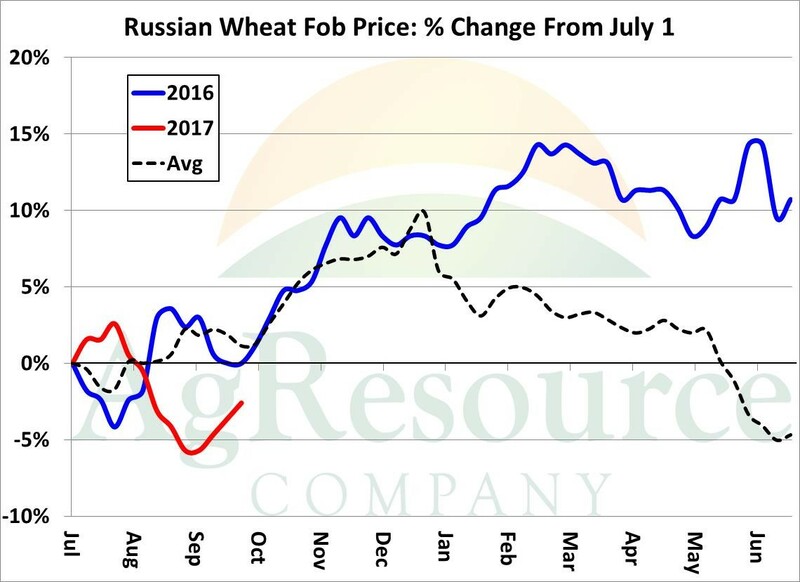 This week in particular has seen Russian cash prices up almost every day, and it’s very, very likely that Russian wheat will rally another $8-10/metric ton ($.20-.30/bushel) by late November. This of course makes US wheat more competitive, especially at current prices, and also will act to support feed wheat prices in the Black Sea and Europe, the world’s top exporting wheat regions. Feed wheat seasonality is similar, and the most likely scenario in 2017 is that by Nov/Dec, global feed wheat offers will reach $180-185/MT, compared to $172/MT currently, and which is well above global corn prices. 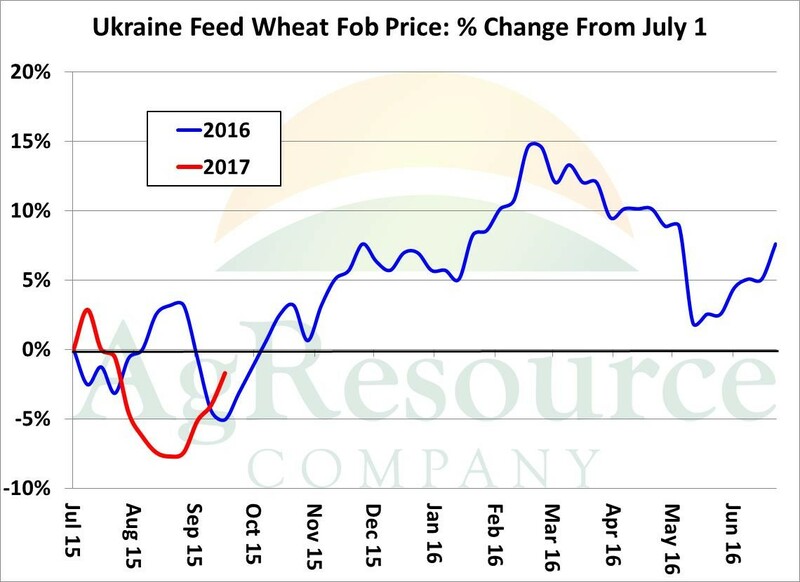 Already, Ukrainian feed wheat is priced at a $17/MT premium to US Gulf corn. 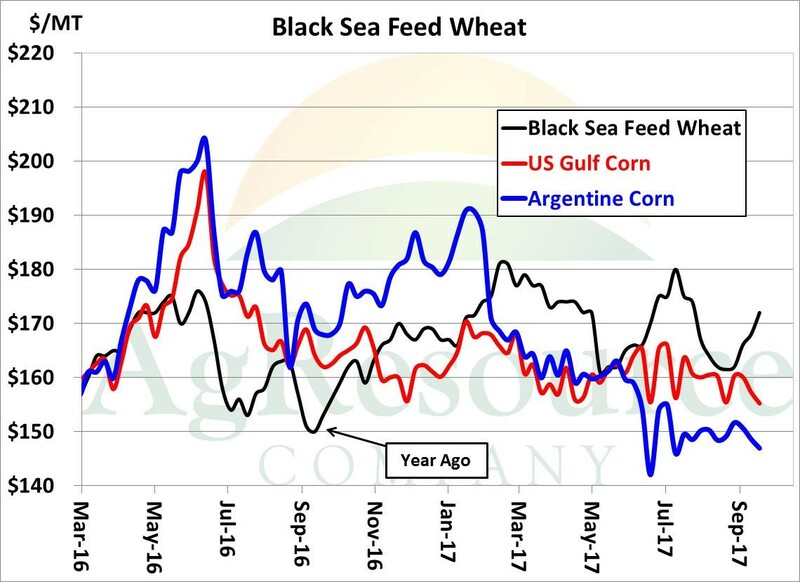 And though Argentine corn is still by far the cheapest feedgrain in the world, the coming boost in total global corn demand will spill into the US. Notice in the graphic above that one year ago feed wheat was priced at a substantial discount to corn. The debate over final US corn yield rages on, and though we think the USDA’s estimate is still a bit too high, the point is that seasonal bottoms in all grain markets were found a couple of weeks ago. US corn inventories will be pretty lofty in 2017/18, but speculators hold a sizeable short position, and much uncertainty exists with respect to South American weather. And, very slowly, world grain stocks are beginning to decline.